Place your caravan or motor home onto our forecourt. There is a power supply with 400V or CEE16A available. No dumping station available. You can freely use the infrastructure (excl. fireplace CHF 20.-). Don't forget mosquito repellent during summer time. Beverages: are not included but can be purchased from us. The heated recreation room may be used, but cooking is not possible. It has a microwave, fridge and coffee maker. Crockery, cutlery, glasses, salad bowl, ... may be used and washed again. Outside the creek ours can Barbecue area to be booked. Everything is available here. Sometimes guests take their camping stove with them to cook outside. We are planning a communal kitchen in the guest area above, this is possibly at the end of the year in use. The room rate is without breakfast, but may be booked on request. Everything is ready for self-service in the fridge, we provide fresh bread in the morning. If you are 5 persons or more, we provide a breakfast buffet. For food intolerance / allergies (milk, lactose, gluten etc) we are happy to provide a customized breakfast. We can also simply provide you with the food for the grill with a salad or sandwiches with ingredients at your requests. Unfortunately, we have no restaurant in the village. 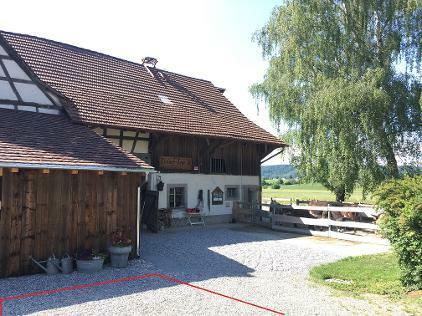 Possibilities: Restaurant in the neighboring village of Ramsen (eg Hirschen, Schäfli) or in Stein am Rhein, Diessenhofen, Schaffhausen or in the German neighborhood.